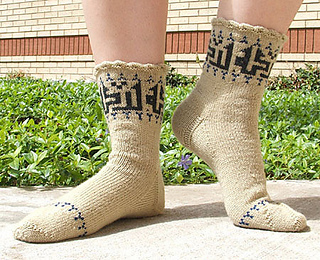 The motif of these socks is Arabic calligraphy of the word "baraka", meaning "blessing". 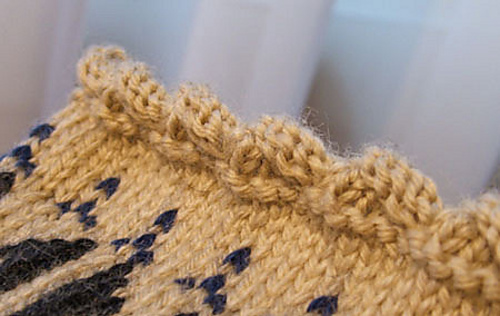 The chart was originally published in A History of Handknitting, and was found on a pillow entombed in 1275. The twisted cuff echoes the spiraling purl decreases on the toe, which in turn mimic the garter ridges and seam stitch on the comfortable, turned German heel. 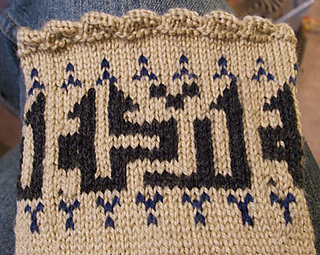 Knit these for someone in need of a few blessings. With good thoughts and a prayer in your heart, the recipient will know they are cared for. These socks are worked from the cuff down with the twisted edge worked flat and then joined in the round for the rest of the cuff. The heel is a turned German Heel with a garter “seam-stitch” on the center back of the heel flap, which echoes the garter ridges on the sides. 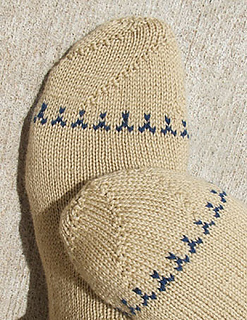 The toe is decreased over 3" using purl decreases to give a comfortable and beautiful fit.